Even as small businesses, us photographers need to have a defined brand identity in order to know how and where to market effectively, to be remembered and to create an experience for our clients. Figuring out and developing your brand identity is a process that can take some time and cost some money. Eeek! And as busy photographers and business owners, that may seem like a luxury we can do without. But the truth is, without a strong brand, you don't have a business. Even if you've never developed or thought about your brand, everything you put out there about yourself, your photography, you business, that is your brand. So doesn't it deserve some time and consideration? TIP: Remember, branding is more than visual. It flows through into every aspect of your business: what you write on your website and on social media, how you interact with people, the service you provide to your clients. Working out your brand values is a process that can take time and requires you to dig deep. But it's worth it because it is the foundation of marketing and running your business. To get you started, we have added a Branding Blueprint to the free DFP Resources Library, so head there now to download your copy. As for the cost, yes, a branding expert will, quite rightly, charge an hourly rate, that you might struggle to justify when you are starting out. 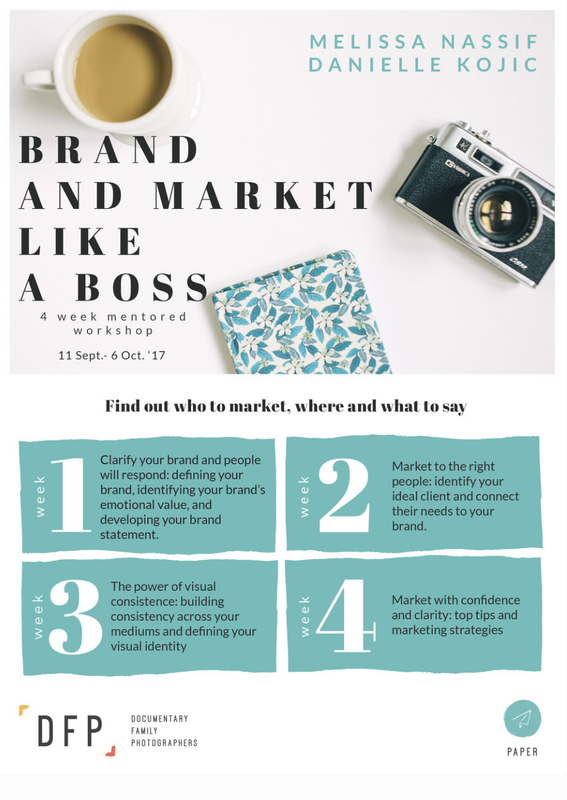 That's why we developed this €299 4 week mentored workshop with branding experts Melissa Nassif and Dan Kojic - so that you could benefit from expert advice, without the corporate price tag. By the end of the course, you will be ready to go places with your photography business, confident in who you are, what you stand for, who your clients are, how to attract them and how you can best serve them. You'll look and feel like the professional you want to be.